This is the second room on hour new home tour. 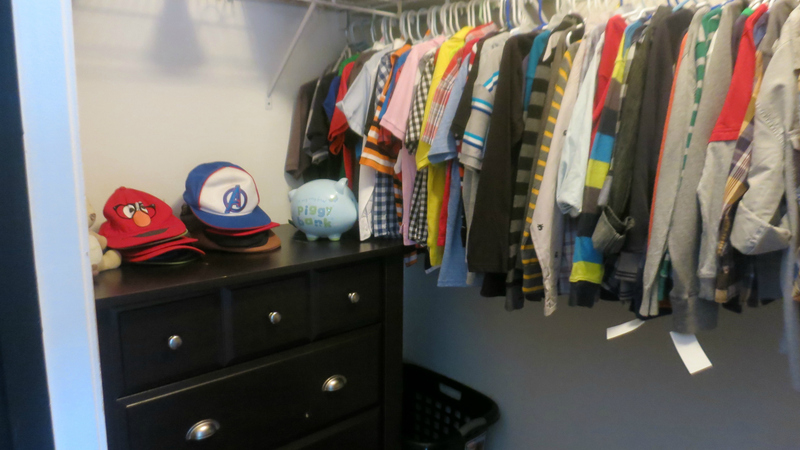 Last week I discussed how I wanted to keep the Superhero Play Room clutter free I went with the same motto when deciding on what will be in the boys “sleep room.” From the day we first shown the boys the new house we always referred to this room as the room so there is no misunderstandings about what was to occur in this room. In our previous house they had their own rooms, but we decided to forgo that so they can have a designated playroom upstairs. 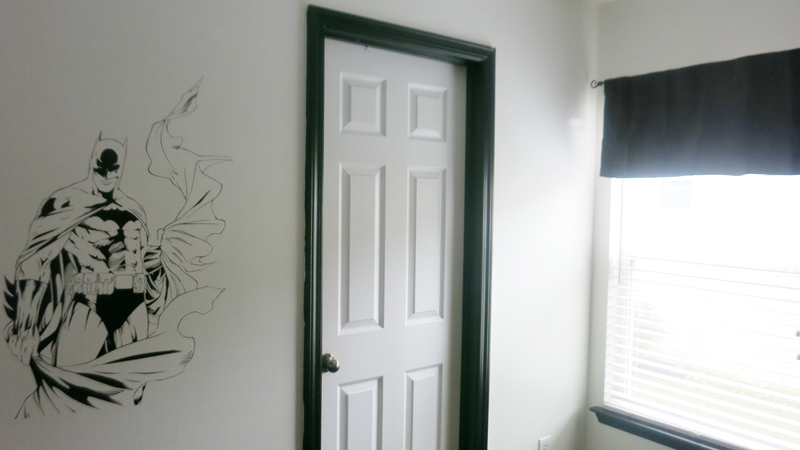 The before picture is from the listing of the house so the previous owners decor, as you can see I went with a simple black and white scheme instead of the burgundy and yellow that we inherited. We put two bunk beds in the room because our boys love to have sleepovers and now there is enough room for everybody! 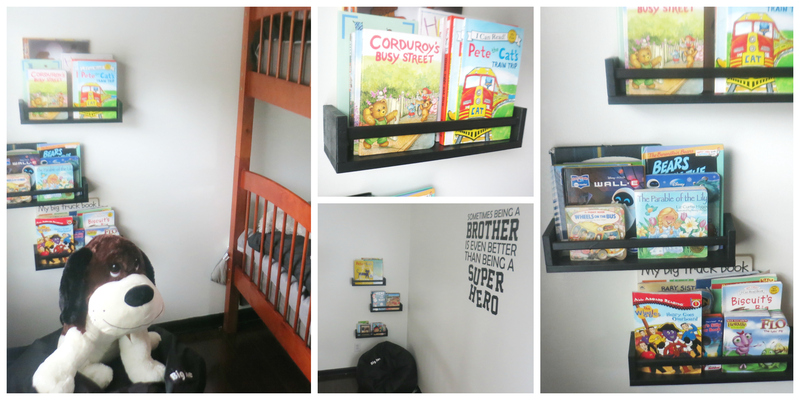 In addition to being a sleep room each boy has his own reading nook. Each boy has a Big Joe bean bag chair and shelves created from spice racks from Ikea. I made sure to go them a soft place to land when they slid out of their beds. 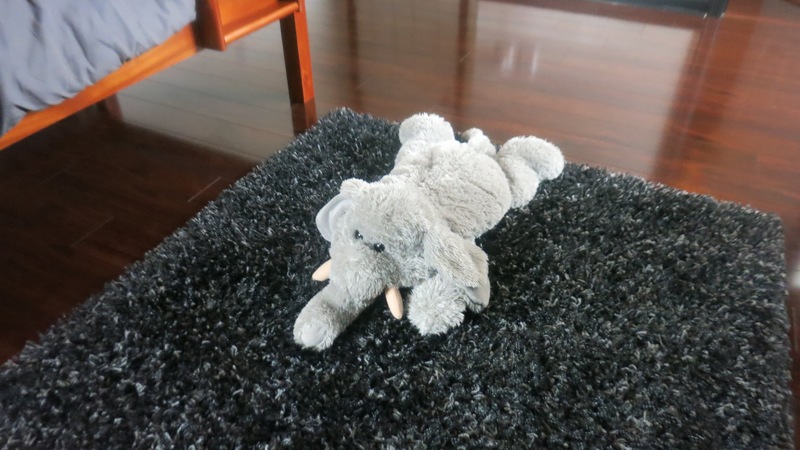 This cute grey and black shag rug fit the bill perfectly. The biggest transformation in this room wasn’t just painting the walls white but the very tedious task of painting the trim black. I think it was truly worth all the hard work I put into it. I know some of my readers, like some of my friends whose seen the boy’s room, might be thinking well where is the dresser. Here it is, the closest is so roomy that actually fits perfectly inside with room to spare. It’s important that you remove any painters tape promptly, otherwise the paint becomes tack and peels off when you remove the tape. If you are like me and don’t remove your tape promptly, simply score along the edges before removing tape to avoid unnecessary touch-ups. Does your little ones have toys in their sleep room? Do you think it’s a distraction at bedtime? I like the idea of having a separate play room! I don’t have kids, but I used to be a full time (24/7) caregiver for some little kids, and I know how impossible it was to get them to fall asleep at night! Plus, having a play room makes it a little more exciting to go play in there. And there is more room for toys! I love how you decorated the “sleeping room.” It is Pinterest worthy! Very cool! 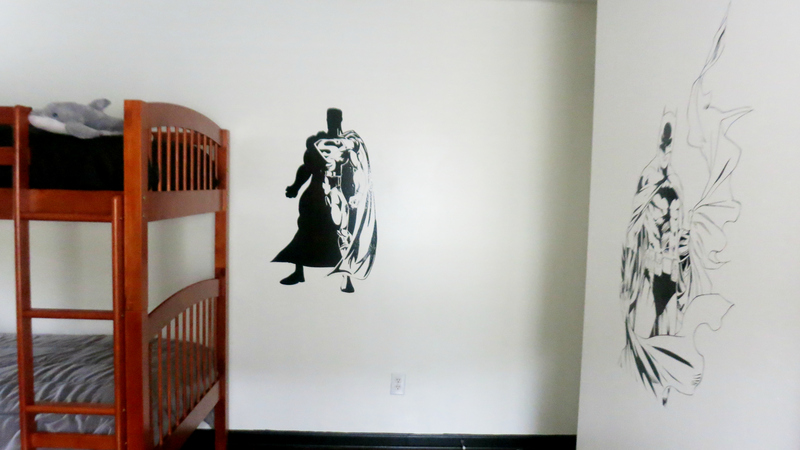 Love the batman decal and the book shelves! I love the simplicity of the room! My kids always had their toys in their sleep room. It was never a big deal for us but I can see how it could be distracting. I have seen through other friends and family members where they thought the kids were sleeping but they were actually still up playing. Which is fine if they are well rested the next day but not so much if they are not. So I just decided to avoid that all together. I myself grew up with toys in my room and it wasn’t an issue. If you have the space for a seperate play room, I am sure its a great idea; especially if you have more that one child. But the majority of the world, through decades, have been sleeping in the same room as their toys and we all turned out just fine. This is great. I love the black & white – makes it simple to decorate. My fave part are those superheroes on the walls. My son would love those. Wow, what a transformation! Great job, and I bet the boys feel very special and grown up in their room. I love the idea of a monochrome room for kids. Black and white has always been a favorite combination for me. I bet the beds would look great in black! Great job on the room! I bet your kids love it. 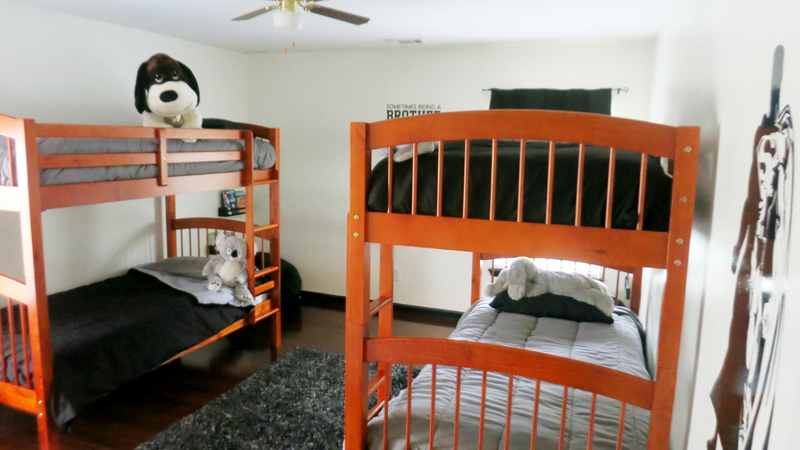 What a sweet little place for your boys – bunk beds are so fun! I had my first bunk bed in college in the dorms 😉 But I had the bottom bunk since I got up earlier. I bet your kids love it! 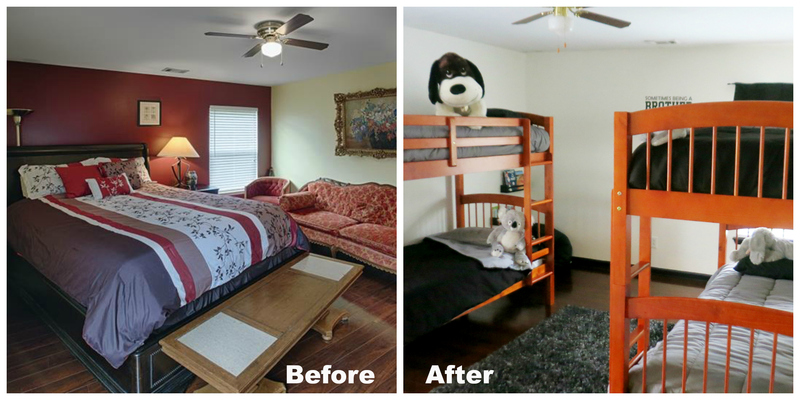 Those bunk beds came in handy when we had 19 people sleeping in our house during the holidays! This is adorable! I love the color scheme. Thanks for the painting tip too! I love the way this room turned out. The decals are a great touch. My kids had a few toys in their rooms when they were little. It was not to much of a distraction for them. 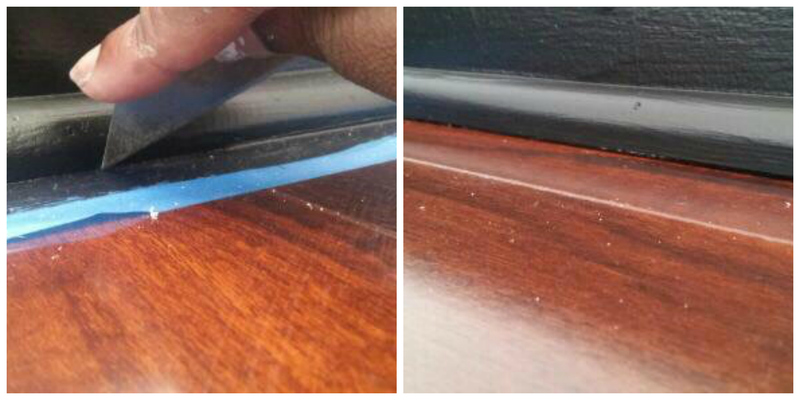 That is a great tip abut the tape. I like this room too. It is a nice calm room compare to the exciting play room. I find it really creates balance for my boys. I may have to put a few “quiet” toys in their sleep room, because when they go in the playroom and play quietly it wakes up the whole house! Yolanda I am loving the decor of your boy’s room! The wall decals are a great touch and those book shelves! Great job! It looks so clean and presentable! You can never go wrong with black and white!